Welcome dear dollhouse crafting friends. Glad you dropped by. Let's get started talking about these awesome web building accessories. The Structure of your E-Biz is a bit like Building a House. A Dollhouse. Constructing a enterprise of substance you are going to need great website tools to help with the process. And every web host has them. Most from our experience were not everything that we had ever hope for. We actually wanted state of the art for next to nothing. We know that was a bit much to hope for considering we were only paying by times maybe $6 a month for hosting. But it said it had all the bells and whistles for that price so we thought it did. The suspense of BB2, one of SBI's newest website tools however is manageable. That's the latest, greatest and most interesting tool available on SBI at this moment. You can login to your control panel and start writing and designing your latest web pages at the snap of your finger. This newest tool makes creating fun and easy. By now you probably know we are raving fans of SBI (Site Build It) and we are not going to hide it. But we do wish they would hurry at SBI and just as Nike says, "Do It!" You see at present us old upload your own html kids, which is what at-the-doll-house.com is by choice, are still waiting while all the newbie's get to go wild. And apparently they are. And so would you if you signed up today. However we'll try not to hold it against you as long as you create an awe-inspiring, go-get 'em enterprise, that your friends and family will say, "How did you do that!" about. Now's the time however, for state of the art on Site Build It. Guess we finally get what we have always wanted. And so will you. BlockBuilder 2 (BB2) is only one of the many website tools though, there are a lot more great ones just like it on board. Such as: SBI! 2.0 for you and for all of us. Which is what this tool is all about. That's right it's sort of a community building system in your site. In other words it makes building a community online simpler and easier. Then there are ways to track your traffic and search for unique stuff online. Design helpers like, Niche Choose It, Value Exchange, Universal RR URL, and Spam Check. Everyone these days hates spam as we are sure you do. And then according to some people with SBI, this website tools list will expand and all for a low price like $29 a month. Amazing really. Imagine with us as we explain how our community at SiteSell works online. 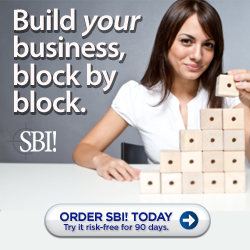 SiteSell, Site Build It, or SBI are all one and the same ways of addressing this amazing company. It is a place where the owner Ken Evoy began a long time ago telling people to "help and be helped". That's the nucleus of this community of netpreneurs. So you will encounter plenty of people who will help you build a solid business. That's the beauty of it. It is the best place on the web for community and extra, extra help building your soon to be successful web business online. SBI teaches such things like how a searcher or a future customer finds you with long tail marketing. You can read all about an unending group of case studies and come to your own conclusions we suppose. Before you go however really investigate their web hosting, do a comparison of wordpress or SBI, join their blog for information it's free, see how the services they offer compare to others, and then if your are so excited as we know you will be check out their order page here. Ever growing web help community that assists you any time you need their help in developing your own business from the ground up. Many more too numerous to list.